I created this card for a dear friend that I have not seen all summer.Nothing fancy. Just a quick card that I could get in the mail tomorrow. Such a pretty card. Love the colors and details especially the flowers on the inside. Hope your enjoying your weekend my friend. Well this may have been fast but it sure is beautiful! I love the colors, papers and wow the in side is my perfect. Your friend will love it! It's a really pretty card. I love the Blossom Buterflys paper pack you used. It has some really pretty paper in it. The inside of the card is just as pretty as the outside! Your card is so sweet!I have that Stack & Love it!I usually play with it when I need to create something for a Birthday. :) The inside of the card is Gorgeous! That's how I see spring and summer, full of color. Beautiful card!! Love all the elements, the buttons, the border, the butterfly and that paper is so pretty! Thanks gf. I hope your weekend went well to. What a cheerful little card! Love the colors and butterflies. The inside is really pretty with the flowers! Great job. I;m sure your friend will love it! Super cute card. Love the colors and the flowers on the inside!! Thanks Annette, I'm already a follower of your blog. I added your button the other day when you added mine. 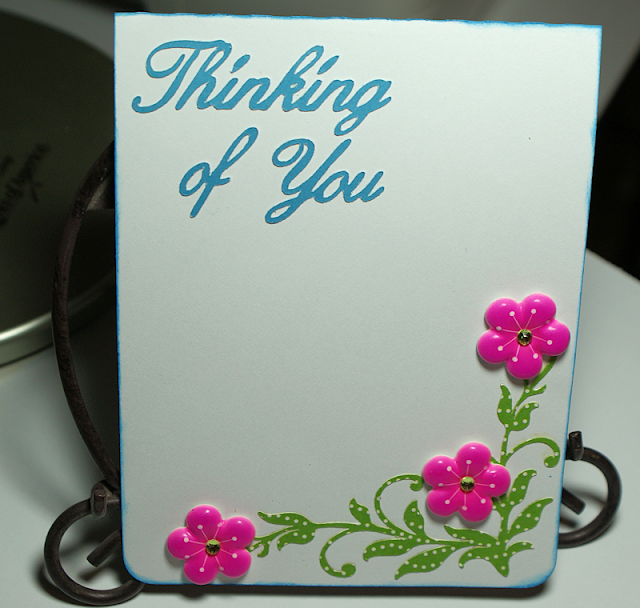 Cute I like the pretty butterfly, and what a great way to send someone a thinking of you card. Thanks for shareing,God bless and have a bless week. What a gorgeous card! Your friend is sure to LOVE it!!! TFS and hope you had a GREAT weekend! love your happy card, sure to bring a smile! I bet your friend will appreciate hearing from you! Thanks Maria. I sure hope so. Gorgeous card Nana, I like the cheerful colours. What a fun and cute card to let a friend know you are thinking of them. Adorable job Nana! Pretty paper on this! Great color! Pretty card and paper she will love it. i love this card!!! the papet is great and those button flowers are perfect! Great card! I like the little butterfly and that pattern paper you used!! Wow! This is a great card. I can't believe you made it quickly.